The Washington Area Development Economics Symposium (WADES) is an annual research conference which highlights academic work from researchers at leading economics institutions in development economics in the Washington DC area. Researchers from George Washington University, University of Maryland, Georgetown University, Johns Hopkins University, University of Virginia, the World Bank, the International Food Policy Research Institute (IFPRI), American University, George Mason University, and the Center for Global Development are all participants in the symposium. Contact iiep@gwu.edu with any questions. Download the conference schedule here. 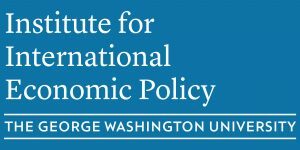 George Washington University’s Institute for International Economic Policy, housed at the Elliott School of International Affairs, is dedicated to producing and disseminating high-quality non-partisan academic and policy relevant research on international economic policy. Areas of focus include international trade, international finance, and development economics.